Ryan Lefebvre is hopeful that [this]Major League Baseball season[…] will be a winning one — but his hopes extend far beyond the diamond. At one time, Lefebvre looked to his career success for happiness, but could not find it there. He sought in vain to fill an emptiness that remained within. The 40-year-old Lefebvre recounted his struggles with alcoholism, depression and anxiety in his 2009 release The Shame of Me, One Man’s Journey to Depression and Back. He has learned a great deal about the role of faith in daily life and has made noteworthy improvements, but still considers himself a work in progress. 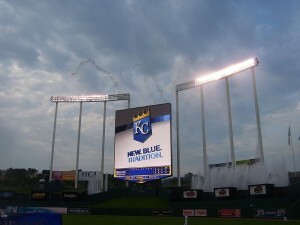 What are you looking forward to with the Royals this season? This year it has been said by many publications that the Royals have the best minor league system in baseball. Hopefully this will help reverse the trend for the past five seasons, which have all been losing ones. … Something that’s interesting about baseball — whether it’s the players or those of us who work in broadcasting — is that it’s not just a job, but a lifestyle. For five months in the off-season you’re on your own schedule 24/7, but during the seven months of the season, it’s totally the opposite. You’re on someone else’s schedule almost 24/7. You’re away from home about four months of the season, with a day off every 10 days or two weeks. What is one of your best baseball memories as a broadcaster?One of my all-time favorite games to call was David Wells’ perfect game in 1998 at Yankee Stadium. 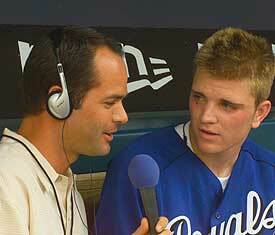 I was with the Minnesota Twins at the time and got to call that one on TV and radio. That was very memorable, along with the final game at Tiger Stadium in Detroit in 1999. Robert Fick hit a monstrous Grand Slam in the bottom of the eighth inning, and it ended up being the last hit in Tiger Stadium. What was one of the lessons your father, former Major League player and manager Jim Lefebvre, taught you regarding baseball that could be translated into everyday life?One of the things that really stood out for me from his managerial days was that he was always very poised with the media. I would be in his office with him and some reporters, and even when he was asked a sub-par question, he didn’t treat it as such. He treated each question as if it were important, even if it really wasn’t. The only exception would be if he knew the reporter was trying to bait him. How did your experience with depression and anxiety begin, and how did it continue?It began when my parents divorced; I was very young, about 5 years old. I didn’t really notice the problem, though, until I was in high school. I was out of my comfort zone at an upscale all-boys Catholic school in Los Angeles, and that’s when the alcohol abuse began. Even though I was in what would be called the “in crowd,” I still felt out of place. Instead of dealing head-on with the issues I was facing, I decided to self-medicate with alcohol. Was there a correlation between the lack of practicing the faith and depression? My priorities were out of whack. I thought that attaining certain outward goals would make me happy, so I was very much into accomplishing them. They weren’t bad in themselves, but when you treat them as being more important than they really are, then you’re in trouble. It can become an idolatry of sorts, and then other things which are inherently sinful can intrude as well. Were there other aspects of Catholicism that you found particularly helpful in getting better?My Catholic faith was the most important thing overall. In college I would always turn to the Church, including participation at daily Mass. That’s a necessary start, but it’s not the whole story. You can’t just go to Mass every day and then expect everything to turn out fine without any other means to help. It’s not just the sacraments alone that help us; God wants us to work through our problems. A father gives his son a lot more in the long run when he expects him to make an effort, rather than just doing everything for him and giving him everything in one shot. God the Father is the same way with his children. Do you have a patron saint, favorite devotion or favorite book?I picked up a St. Daniel medal from a Catholic store years ago in New Mexico and wear it around my neck. He’s pictured with a lion and is known as a patron of wisdom and understanding. I pray for wisdom and understanding, but they don’t usually come easily. We seem to learn best through trials. It’s not like God taps us on the head with a wand and then everything is perfect. There are struggles to get through — but they do make us better people if we take them in the right way.